Call me butterfingers, I almost dropped my can of soda the other day because it was so wet from being chilled in the refrigerator! I never really knew why people used can cozies, but now I know. Here is one that I made for my soda can with plarn (plastic yarn). I’m so proud of how nice and tight the cozy fits on a can. This cozy can also be made with regular yarn if desired, just be sure to do some measuring so that it fits properly. Also I noticed that this cozy makes a perfect pencil holder!!! The plastic makes it really stiff and less likely to fall over if loaded with pencils or whatever you may decide to put in it! Note: your circle should be 2 3/4″ (7 cm) in diameter fitting perfectly under your soda can. After round 8, the bottom of your can should fit tightly into the cozy. If you need help with crocheting this can cozy, feel free to let me know and I’ll be glad to help! This entry was posted on Wednesday, June 10th, 2009 at 12:16 AM by Rachel Choi	and is filed under Free Crochet Patterns. You can follow any responses to this entry through the RSS 2.0 feed. You can leave a response, or trackback from your own site. You sure do keep crochet around. You start off with a circle that you keep making bigger and bigger until it is the size of the bottom of the soda can. Then you keep crocheting around the circle without making it wider, but instead taller so that your can will fit inside. Hi Rachel, I’ve been wondering. Do I really have to place a marker? Shouldn’t it be after round 5 bottom fits can? Also if I might make a suggestion, in row six if you crochet in back loops only it makes for a better fit. Gets the sides started up better. I gotta say I love this pattern! Thank you. Never would have thunk of it! 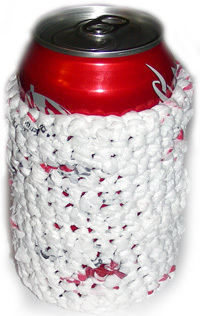 Hi – For a soda/pop can (there’s a word that changes by US region, not just by country — in Pittsburgh it’s called pop while in Baltimore it’s called soda), I found that you do end at Round 5 for a can cozie. This pattern is fun for any size of a similar container or glass. I really like the cozies because they don’t sweat, making cans much easier and more comfortable to hold. The pattern is also good for smaller supplies of plarn (or where you only have a few bags to use). Hi Iva! I don’t have a hat pattern that uses plarn specifically, but you can use almost any hat pattern that you like and substitute plarn for the yarn. We have a bunch of hats in our hat section: http://www.crochetspot.com/store/?category=3 I think the Scarecrow Hat would be wonderful made in plarn! Thank you for a great pattern! One question: after round 1, am I joining the first chain to the last 6sc? I’m extremely new to reading patterns so right now my work looks like almost a full circle but but I didn’t join anything and continued with making the stiches so there is an opening in the back of my cozy. Is it assumed in crochet patterns to join after first round if it is a spiral to make it a circle? Hi Lisa! There’s no need to add a join, you will crochet as it is written, no need to add anything. The pattern will be crocheted in the round, like a spiral. So your first stitch on round 2 will be made into the first stitch from the previous round. You will continue to crochet in the round without joining. Let me know if you need more help with it! I’m going to make this with my environmental science students when they finish their semester exams. Can’t wait to try it! If we are starting by making a ball of plain, then the can cozy, how long do you estimate it might take us to create? Obviously you are more skilled at crochet than we are but I just want to get an idea. BTW – I’m going to contact our local grocery store to see if they’ll give us a large sack of the bags they collect for recycling. Hopefully we’ll have enough for all 150 of my students!